Rommelag FLEX offers sophisticated, tried and tested storage containers and pouring and docking systems specifically for demanding containment needs in the pharma, chemical, and food industries. Flecozip is designed with handling hazardous substances and sensitive bulk goods in mind. The clever system allows for the dust-tight connection of process units and transport containers, and prevents contamination during decanting, filling, or the taking of samples. 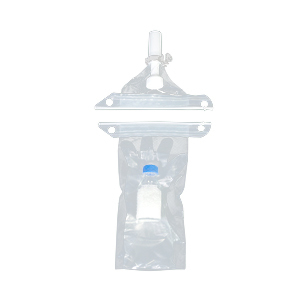 Flecozip is the answer to the stringent protection requirements that have to be met when developing and producing pharmaceuticals. Flecozip also offers impressive cost-effectiveness from start to finish (of the production line), because it’s hard to find a quicker way to achieve contamination-free material transfer with flexible containers. Flecozip is primarily used in laboratories and clean rooms working on the production of active ingredients, for example for weighing in the isolator, for filling and decanting finished tablets, and for transferring powders and other solids. Flecozip can also be used as a secondary housing. There is a flexible isolator that meets the OEB 5 containment level requirements for highly toxic products without the need for costly system conversion and documentation. Flecozip is as modular as your system requirements, be they a straight blown film with a prefabricated half-fastener, with a ring opening for docking to the required process unit, or as a specially prefabricated container with a secondary housing and integrated gloves. It is, of course, also available in various lengths and widths for variable filling volumes. Companies are increasingly using disposable systems for sensitive and toxic bulk goods. Such systems prevent any kind of cross-contamination and reliably meet the ever tighter GMP requirements. 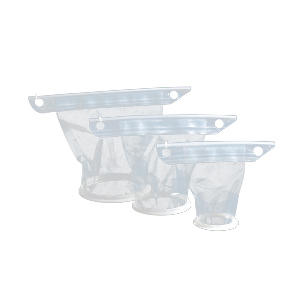 Flecotric, which stands for “flexible containment tri-clamp,” makes connecting process units and single-use blown film types easy, and therefore does away with the need for stainless steel connections in many instances. This also eliminates elaborate cleaning processes, expensive validation, and complex assembly. 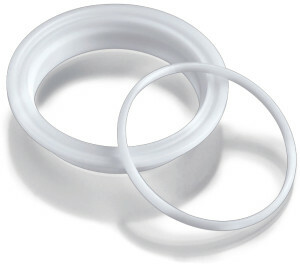 The connecting tube attached with the help of the Flecotric ring is simply disposed of after use and is replaced by a new one. Single-use technology offers the major advantage of being able to process various different products on the same system. This cuts out expensive and time-consuming system conversion and documentation and reliably prevents cross-contamination. The film type used for the connector has a standard thickness of 130 µm. It is, therefore, ideal for powder transfer and for filling/decanting processes. For weighing, we offer film thicknesses starting at 50 µm, to give you as accurate a result as possible. The containers are available in various sizes. Depending on the volume, be it milliliter containers for handling very small amounts or 100-liter containers for large volumes, a different blown film diameter is used. This matches the usual connection diameters of the process units and is available in the sizes 2’’, 4’’, 6’’, 8’’, 10’’, and 12’’. Flecotric comes with a standard TC gasket and can, therefore, be combined with other standard docking systems.